For any business or startup, the primary goal in its early years is its growth. Growth hacking enables you to make use of marketing opportunities in an efficient way that drives better results in less time. Social media marketing, blogging, and influencer marketing are some of these marketing channels that can scale up your business with a lower budget and better acquisition cost. Would you want to miss out on all these opportunities that can help you reach your brand to your target audience? If you are a savvy online marketer, you want to grow your business every way you can. Luckily, growth hacking offers plenty of ways you can promote your business and increase its growth. Read more about B2B growth strategies. What Defines a Growth Hacking? In its broadest form, growth hacking encompasses all the tools and techniques that aim at increasing the visibility of a brand in the least customer acquisition cost (CAC). The growth can hide online or off. This job that requires a growth hacker to use different channels like social media websites, online forums, and blogs. The goal is more growth, lower cost per action, shorter time frames. Growth is hard. The best tool to scale up your traffic, Colibri helps you get in front of your audience. It increases the results of your SEO efforts and enhances your online visibility. Colibri lets you know about conversations with your audience. Furthermore, it provides information about which people are searching for your competitors. It is an SEO-driven tool that lets you make changes in your online marketing. Colibri IO shows you where your customers are engaging online so that you can insert yourself into relevant conversations. You can make it apt with the preferences of Google by helping you with the right keywords related to your industry. You can even integrate it with Google Analytics to measure the success of your growth hacking inch by inch. Grammarly is probably the best spelling and grammar checker around. Apart from being able to spot errors other grammar-checking apps can’t, it will also help you optimize your text and make it more readable. Make it a habit to run your text through Grammarly, as it will turn you into a better writer. Find out how to get those typos fixed! Created by none other than Sean Ellis (the brain behind growth hacking). Qualaroo helps you to get insights into your audience using the available statistics. It enables you to identify the browsing pattern of your niche audience and makes you aware of their needs. Using this intuitive tool, you can instantly engage your audience and grow your influence. Outbrain helps you penetrate into the best article places that can connect you to a wide audience in a matter of a few days. This tool makes you visible in ‘from around the world’ section of the world’s leading online magazines, e.g., CNN, TIME, Slate and Fast Company. A brainchild of Noah Kagan, List Builder empowers you to build the email list of your leads that you can use to send emails. With this tool, you can promote newly launched products, promotional packages and upcoming events of your brand using emails. It is available for both mobile and desktop users. As its name suggests, Click To Tweet allows you to promote your business on Twitter with just a click. You can use this tool in many ways. For example, you can give an offer to your audience to promote your content in exchange for a gift or a free service. The best thing about ClickToTweet is its ability to tell you exactly about the total number of times a people have clicked your tweet. You can integrate it into the various online resources, such as email, landing page, and social media post, etc. 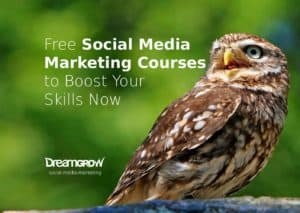 Free social media marketing courses to boost your social media marketing skills. Select the ones that give you the most value, even if you are a beginner. A tool for small businesses to automate your marketing efforts. Infusion Soft enables you to automatically follow-up with your leads and pitch them about your products using their lead scoring. With this tool, you can easily communicate with your prospects using the email marketing tool and the platform of social media. With Crazy Egg, you no longer have to rely upon multiple A/B tests to get analytics about behavior pattern of your visitors. With this fantastic tool, you can learn about as granular details as the number of clicks on a section and engagement of a page. A versatile tool to tweak your marketing activities and channel them to success. Marketo helps you uplift your marketing campaigns and spread it on a range of social media channels. From performing email marketing and automation to getting analytics and social media management. This tool encompasses each and everything you need to market your brand and measure its success. BuzzSumo gets you rid of the barriers of ignorance in your content marketing. It offers you its insights into what content will be the best for a particular keyword, competitor or topic. With this tool, you can learn about strategies and techniques to make your content available to your target audience. Buzz Sumo also allows you to know about titles that work best for social media marketing and blogging. You can also take help of this tool to find the influencers in your industry who can promote your brand. With Unbounce, online marketing is no longer a technical game. It is an A/B testing tool that allows marketers to check the performance of their landing pages using ‘drag-and-drop’ feature. With the help of this tool, you do not have to depend on intricate coding to find out the results of your landing page. So you can test any landing page and then optimize it according to the browsing pattern of your visitors. Zapier is a tool to connect your web applications to ensure a seamless transition of data between them. It makes it possible for you to automate your tasks and connect your web applications without any help of a developer. This awesome tool allows you to add more than 300 apps. Kissmetrics makes you aware of the data related to your niche audience. It collects data from the people as they use the resources of your website. With this tool, you can segment the prospects based on their browsing behavior. This way you can have more control over what groups of people you should be focusing on the web. Olark is a chat application that allows you to interact with your visitors when they land on your website. This tool makes it possible for you to have a one-on-one chat with your visitors and let you know what they want from your business. It also allows you to peep into activities of your visitors as they navigate through your website. So you will know what resources they are often utilizing on your website. Vero is a useful tool for ingenious growth hackers to get familiarized with their target audience. It works in real-time to make you familiar with your prospects and what they need from your business. With this application, you can dig deep into preferences of your prospects and tailor your strategy accordingly. Hub Spot is a powerful tool to engage your audience with the help of inbound marketing. This application entails integrating the various channels of inbound marketing, such as blogs, social media, emails and landing pages, to promote your business at different levels. No longer do you need to resort to cold calling as you can make a stronger engagement with your prospects with this tool. All you need to do is install this app and you can start your pitching features of your products and capture your leads. Tribeboost drills down the group of your audience that you want to follow you back on Twitter. It is an intuitive tool that enables you to follow only those people whose content interests you. You can even set filters to segregate users based on their number of followers, Tweet counts, and engagement level. Growth hacking becomes easier when you do it in a specific way. With these tools, you can make your growth hacking even more organized and result-oriented. And now you can follow up with content marketing tools for WordPress. BIO: Christina Matthew is a marketing executive in online writing firm and specializes in generating leads through tried and tested marketing strategies. When not strategizing marketing plans, she writes informational blogs on the topics of her liking. Thanks Christina for the article. Great summary of the major growth hacking tools! We a’re launching a new free product https://www.gethighlights.co/ to help solopreneurs, entrepreneurs and small businesses automatically find and prioritize the biggest marketing opportunities using the data in their existing marketing tools (Google Analytics, MailChimp). It monitors all key metrics (open rate, click rate, bounce rate, page load speed, page content) and highlights the ones that are performing the best. It also identifies low hanging fruits like old blog posts that are performing well and can be leveraged to get more sales or signups. These are great tools and I’m definitely trying the others! I also recommend Phlanx’s Collaboration Portal – you can find a lot of opportunities listed by business owners – small and big brands. Bloggers are also posting on that site to find collaborations. I use this free tool to find bloggers I can collaborate with – to help promote my products and boost my engagement and sales. Hope you can check it out. Cheers!